^ Chun, Wendy Hui Kyong (1999). “Unbearable Witness: towards a Politics of Listening”. Journal of Feminist Cultural Studies 11 (1): 112-149. ^ a b c Eglin, Peter; Stephen Hester (2003). The Montreal Massacre: A Story of Membership Categorization Analysis. Waterloo, ON: Wilfred Laurier University Press. ISBN 0-88920-422-5. ^ Rathjen, Heidi; Charles Montpetit (1999). 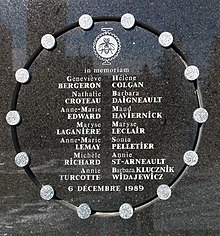 December 6th: From the Montreal Massacre to Gun Control. Toronto: McClelland & Stewart. ISBN 0-771061-25-0. ^ a b Parent, G; Cousineau, M (2003). “Conséquences à long terme d'un mass murder :le cas de Polytechnique, neuf ans plus tard”. The International Journal Of Victimology 1 (3). http://www.jidv.com/PARENT,G-JIDV2003-1-(3).htm 2006年12月29日閲覧。.